WASHINGTON — Senators have a bipartisan deal to require labeling of genetically modified ingredients nationally, a week before a labeling law in Vermont goes into effect. The agreement couldn’t become law before Vermont’s law kicks in July 1, since the House is on vacation until July 5. Legislation passed by the House would make the labeling voluntary, but that measure stalled in the Senate earlier this year. The food industry has lobbied to block Vermont’s law, arguing that GMOs are safe and the labels could be costly for agriculture, food companies and consumers. The industry’s main lobbying group, the Grocery Manufacturers Association, said it is backing the senators’ deal. The group has opposed mandatory labeling nationwide but advocated for electronic labels in negotiations. “This bipartisan agreement ensures consumers across the nation can get clear, consistent information about their food and beverage ingredients and prevents a patchwork of confusing and costly state labeling laws,” said Pamela Bailey, president of that group. Two top Vermont officials immediately opposed it. Gov. Peter Shumlin criticized the two-year delay and pre-emption of Vermont law, among other provisions. Sen. Bernie Sanders said he would do “everything I can” to defeat it. “People have a right to know what is in the food they eat,” Sanders said. Genetically modified seeds are engineered in laboratories to have certain traits, such as resistance to herbicides. The majority of the country’s corn and soybean crop is now genetically modified, with much of that going to animal feed. Corn and soybeans also are made into popular processed food ingredients such as high-fructose corn syrup, corn starch and soybean oil. The food industry says about 75 percent to 80 percent of foods contain genetically modified ingredients. 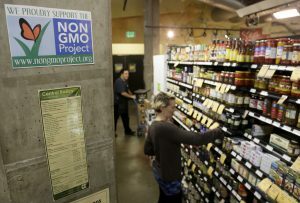 Those advocates have fought state by state to enact mandatory labeling, with the eventual goal of a national standard. They have frowned on digital labels, saying they discriminate against people who don’t have smartphones, computers or the know-how to use them. “This proposal falls short of what consumers rightly expect — a simple at-a-glance disclosure on the package,” said Gary Hirshberg, chairman of the advocacy group Just Label It and the organic food company Stonyfield Farm.